Janis Stirna has received a degree of Doctor of Philosophy in Computer and Systems Sciences from the Royal Institute of Technology, Sweden in 2001 and Associate Professor (docent) from Jönköping University, Sweden in 2008. In 2015 he was promoted to full professor at Department of Computer and Systems Science (DSV), Stockholm University. Stirna’s current research interests include enterprise modelling and requirements engineering methods and tools, organisational patterns, knowledge management and transfer of best practices. Stirna is an author or co-author of some 70 research reports and publications as well as two text books on Enterprise Modeling. He has participated in thirteen EU financed research projects. 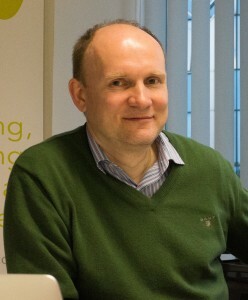 He has co-developed the EKP – Enterprise Knowledge Patterns, the EKD – Enterprise Knowledge Development, and 4EM – For Enterprise Modelling approaches. Stirna coordinated FP7 project CaaS – “Capability as a Service for digital enterprises” with a primary focus on developing methodological support for design and delivery of context dependent business services. He is teaching Object Oriented System Analysis with UML to first year BSc study programmes at DSV, Stockholm University. He is currently vice-chair of IFIP Working Group 8.1 Design and Evaluation of Information Systems.